Location: The historic Doc Thomas House, located in Miami, Florida, serves as headquarters for Tropical Audubon Society. The rustic and charming Doc Thomas House sits in stark contrast to the bustling downtown South Miami corridor in which it is tucked. Presiding over nearly three wooded acres along Sunset Drive, its near-native setting boasts some of the only Dade County pines remaining in the neighborhood known as the High Pines. Built in 1932 at a cost of $4,500 and utilized today as a working museum, the house’s wide front porch, original wood sash windows, applied wood cornices and other detailed woodwork distinguish it from the otherwise largely concrete-block homes and commercial construction that surrounds it. Designed by master architect Robert Fitch Smith, the residence of Arden Hayes “Doc” Thomas is an enduring reminder of the community’s formative era. Thomas was a distinguished pioneer and local businessman who founded the O.K. Drugstore and O.K. Feed Store in the 1920s, and significantly contributed to the growth of the South Miami community, then known as Larkin. As the local pharmacist — residents looked to him as the town’s quasi “doctor” — he knew just about everyone and was well regarded in the community. Dade County Historic designation was awarded to The Doc Thomas House in 1982 and in 2014 it was listed in the National Register of Historic Places, a significant achievement for the modest structure and a meaningful tribute to both its architect and owner. Gaining prestigious national status will help shine a spotlight on this precious and little-known piece of old Florida history, and should help facilitate earning grant monies for its continued preservation. The Doc Thomas House was designed to complement the pine and hardwood hammock that its owner was so enchanted by when he moved to South Florida from southern Indiana in the early 1920s. When he encountered a young architect named Robert Fitch Smith, who was serving as the first Dean of Architecture for the University of Miami, Thomas commissioned the rising star to design his 3-bedroom cottage, which is considered Smith’s first residential commission. The structure Smith conceived exhibits a unique and now-rare example of wood-frame vernacular prevalent in the early 20th century; that the house still exists in its original condition in its original setting speaks to its exceptional integrity. The interior and exterior walls are built from red tidewater cypress. The parlor floor consists of random-width boards decoratively pegged with mahogany and separated by walnut strips. The floors in the kitchen, breakfast nook and bedrooms are Dade County pine. The fireplace incorporates the oolitic limestone underlying South Florida, and coral rock, so named because it is fossilized coral containing the remains of sea fans and other marine animals; it underlies most of the Florida Keys. Though a world traveler and socialite of some repute, the dapper Thomas remained enduringly fond of his adopted hometown, and would reside at 5530 Sunset Drive for more than four decades. On December 23, 1974, he officially donated his house and grounds to Tropical Audubon Society as a life estate, a provision that enabled him to live on the property until his death in January 1976. Since that time, thousands of visitors have enjoyed the Doc Thomas House and grounds, which are flanked by South Miami and Coral Gables. The gates are always open. Picnic tables beckon from beneath the shady canopy. Nature trails thread the pine rockland and rockland hammock habitats. Area residents and business people take their lunch breaks here; workdays draw volunteers from the both private and public sectors; Environmental Education programs lure area school classes, scout troops and garden clubs. 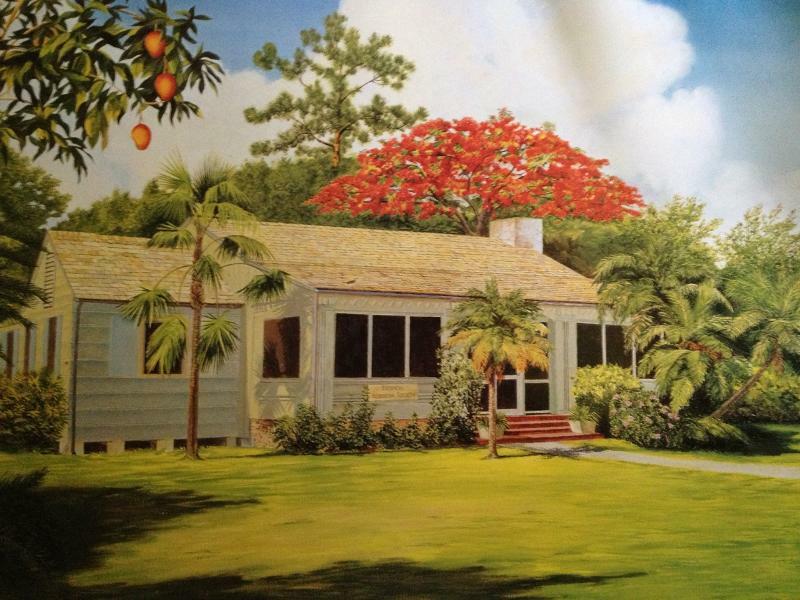 Special seasonal events, such as SoMi ArtWalk, showcase the historic house to great effect. Birthday parties and weddings are also staged here. As its steward, Tropical Audubon Society endeavors to maintain the Doc Thomas House in its original condition, restoring aspects of it as needed, and honoring the visionary and generous Doc Thomas. It was his desire that the property be used for the education and enjoyment of area residents and visitors. To help maintain this historic site, please send your donation marked “Doc Thomas Fund” c/o Tropical Audubon Society, 5530 Sunset Drive, Miami FL 33143. Call (305) 667-7337 for membership information or visit our donation page.